Hiya guys! Time to start a new week and I'm starting it with the only way a polish girl does. With a super bomb polish. I'm hoping that the Polish Pick Up didn't wreck your wallets too much because I have quite the stunner for you. The word 'stunner' feels like an understatement when it comes to this shade. You know a polish is fabulous when it can even make my shorties look gorgeous. 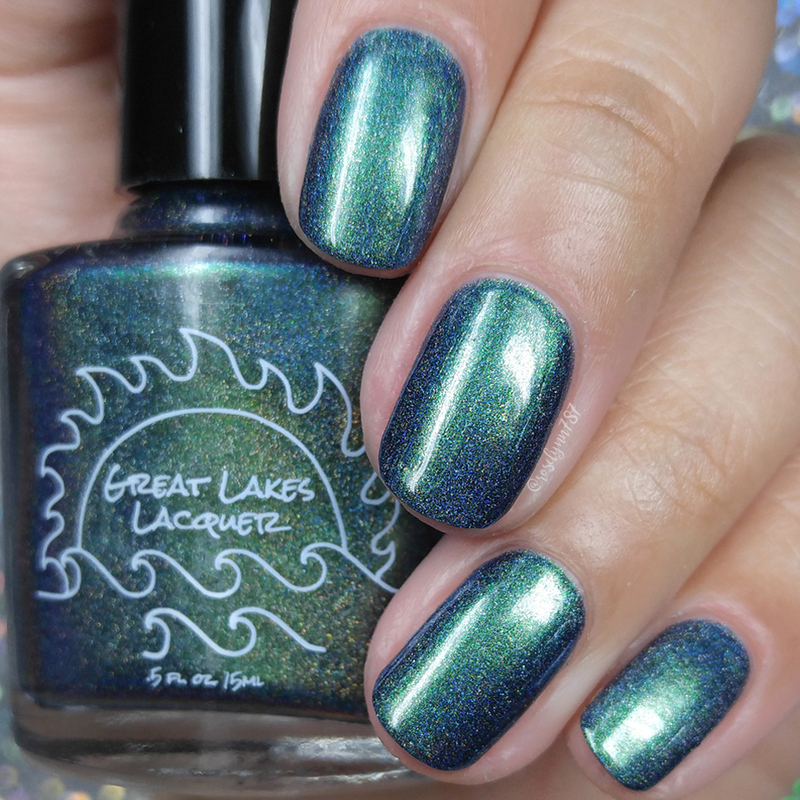 Today I'm sharing swatches for the Holo-maniacs Facebook Group Custom #31 by Great Lakes Lacquer. Teal? Multi-chrome finish? And holographic sparkle?! Do I really need to say more at this point? I think not people, now let's get to the swatches! 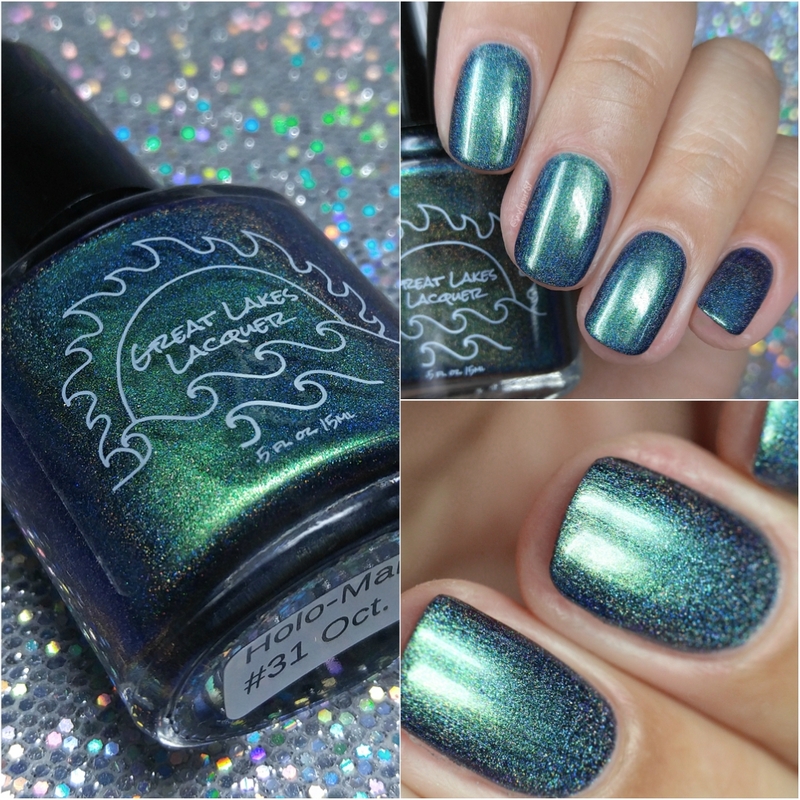 Great Lakes Lacquer Holo-maniacs Custom #31 will be available for purchase Sunday, October 7th. This exclusive custom shade will only be available through the end of the month. Each full-size 15mL bottle retails for $12, but you will need the code in the Holo-maniacs Facebook Group in order to make the purchase. Holo Maniacs Custom 31 can be described as a purple based multichrome linear holographic with shifts of green, blue, and purple. Photos cannot even begin to capture how truly gorgeous this shade is! Not to mention all the color shifts this has. That aside, the color is also really complimentary against my skin-tone. It's also versatile and can be easily worn for any occasion or season. Definitely a must-have for any collection! Same lighting, shown at an angle. The formula has a smooth opaque application that is almost a one coater. I definitely always prefer adding even a second thin one for sparkle. It builds-up evenly throughout the nail and has a really fantastic creamy finish. Consistency wise it leans on the thin side, but it's manageable and didn't give me any issues. There are minimal brush strokes in the finish that blend out after topcoat. I experienced no staining on removal to my nail beds or cuticles. Shown in two coats and sealed with a glossy topcoat. To recap, Great Lakes Lacquer Holo-maniacs Custom #31 will be available for purchase Sunday, October 7th. This exclusive custom shade will only be available through the end of the month. Each full-size 15mL bottle retails for $12, but you will need the code in the Holo-maniacs Facebook Group in order to make the purchase. Glam in Grey with Sally Hansen and Rimmel London! YCC Agency Welcomes Young Nails Inc! The November Holo Hookup is LIVE! Halloween with Sally Hansen and Rimmel London! 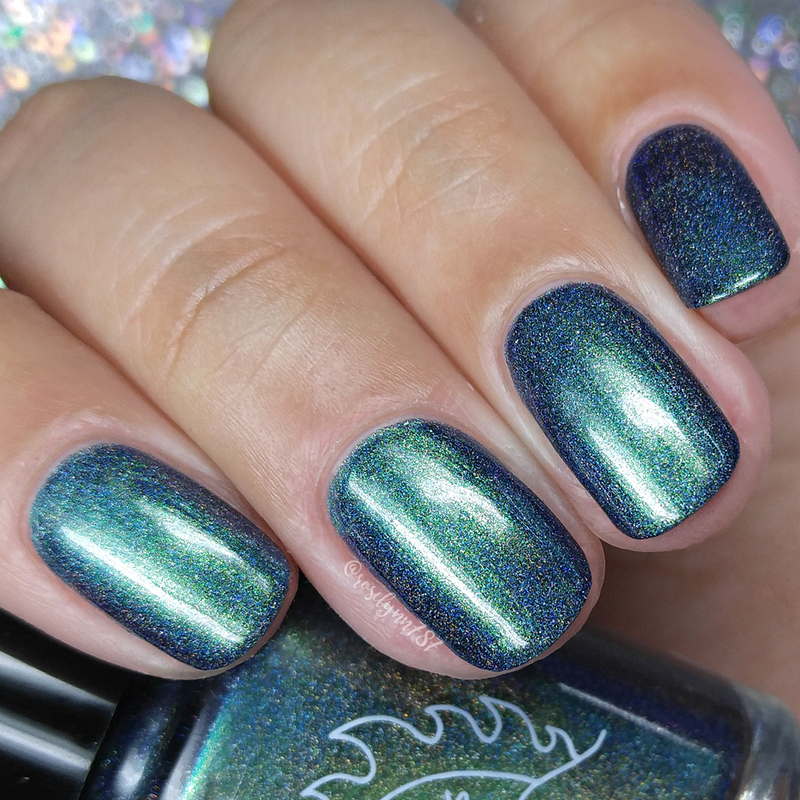 Enchanted Polish - Pre-Order Coming Soon!! NEW! Sally Hansen Chrome Kit! Plums The Word for Fall!